Delicious Paw Print Cut-Out Cookies donated to a K-9 Unit fundraising event! I have also bought merchandise from jewelry, cooking, and candle companies in support of fundraising events. I have also been on the other side of the fence and sold products and donated my commission to help those raising money for a cause. One of my favorite ways to contribute is to bake! 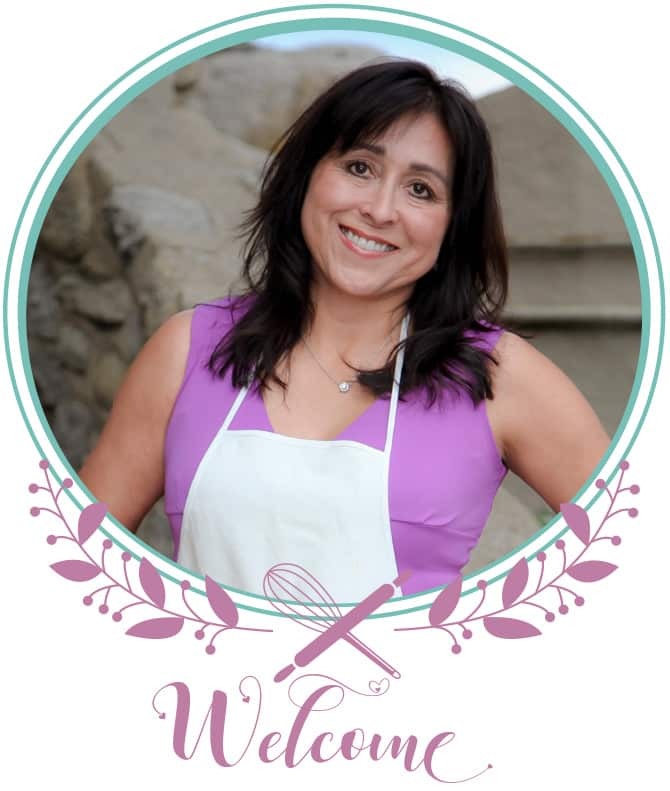 I’ve made and donated a lot of baked goodies over the years, which has been a successful and fun way to help raise a few bucks. My co-worker was part of a group raising money for a K-9 unit in Reno, Nevada, and for the life of me I can’t remember the name of the organization! I believe it is similar to The Knights of Columbus, but I know it wasn’t that exact group. Anyway, the group has been raising money to purchase automatic door release systems for the patrol vehicles in an event the canine needed to assist the officer outside of the vehicle or had to get out of the car in an emergency. have no idea how much something like that would cost, but I do know my heart just melted at the thought of a sweet puppy-like German Shepherd getting stuck in a car, especially during the summer months in Nevada, which I believe is what happened and prompted this need. The fundraising group collected baskets filled with merchandise to raffle and wanted to sell whatever else they could to raise as much money possible to reach their goal. I baked and decorated 2 dozen of these Paw Print Cut-Out Cookies, and I was happy to learn that they started to sell before the event even happened! AND my co-worker received over $50 in donations! I don’t know why I don’t make cut-out cookies more often. They look so pretty and the cookies taste so good! 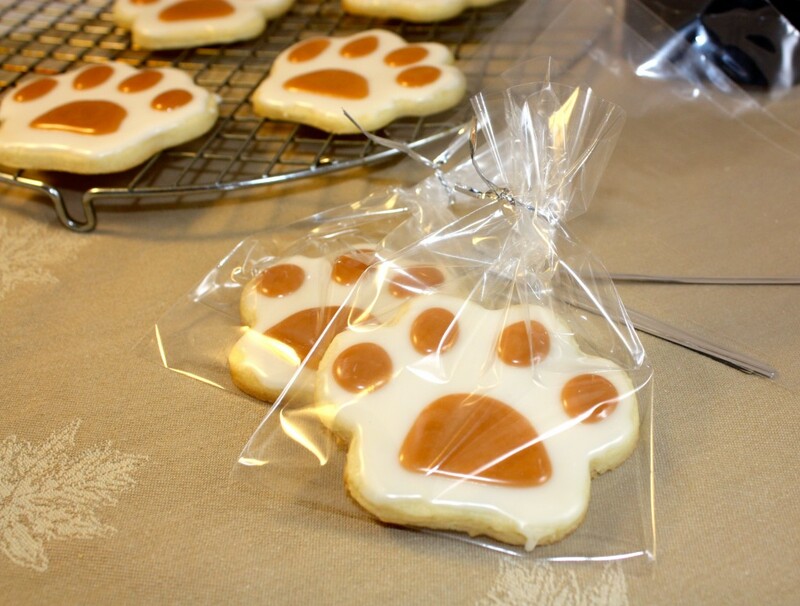 I bought the paw cookie cutter and cellophane bags at my local craft store, Michael’s. I’ve also made Christmas and Valentine cookies using this recipe. The dough is easy to work with, but it does need to be refrigerated for a couple of hours before rolling it out. I’ll be baking some cut-out pumpkin cookies and a fall leaves just for the fun of it! 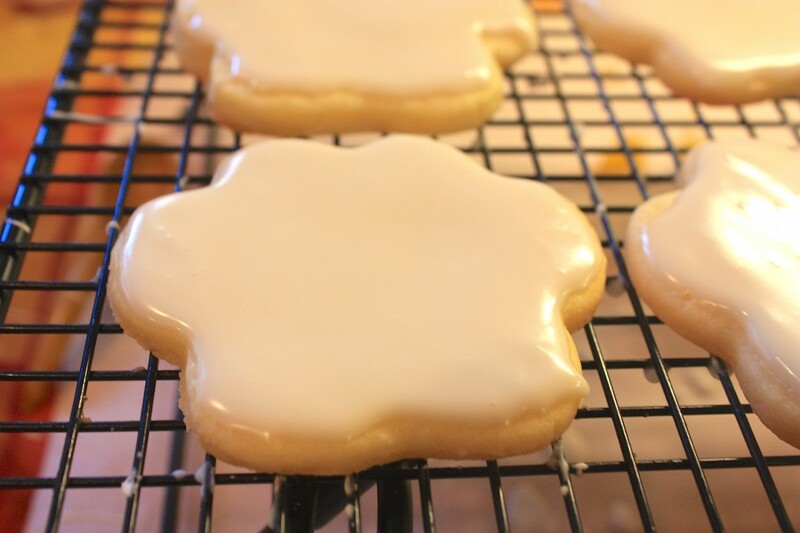 Do you bake cut-out cookies throughout the year? Perfect dough for cut-out Cookies for any occasion. Preheat oven to 375 degrees and line two cookie sheets with parchment paper. In a large bowl, beat butter, cream cheese, sugar and salt together until light and fluffy. Beat in egg and vanilla. Add flour one cup at a time. Divide dough in half and wrap each piece in saran wrap. Put in refrigerator for at least two hours. Lightly dust surface with flour before rolling dough. Roll to about 1/8" thickness. 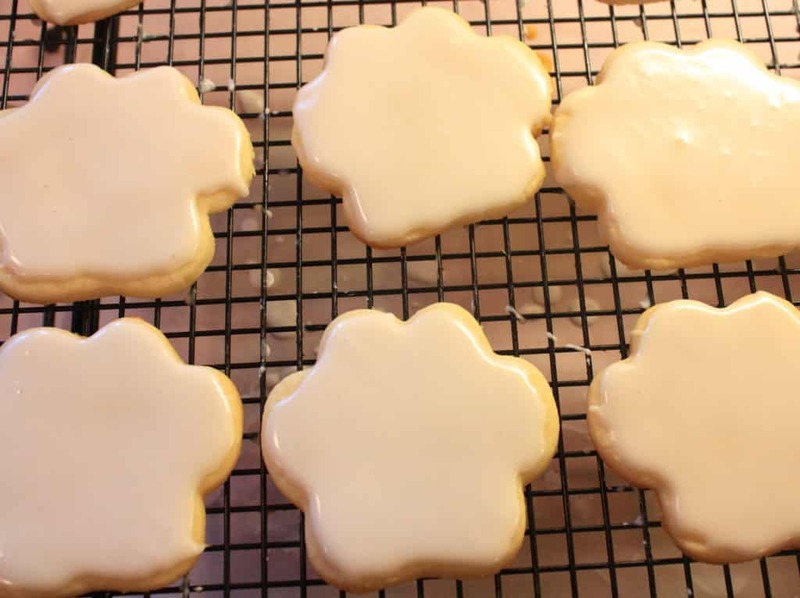 Cut with flour dusted cookie cutters and place on baking sheet 1/2 inch apart. Bake for 8-10 minutes or until bottom edge is light brown. Remove from oven and let set for several minutes before transferring to a cooling rack. Cool completely before decorating. For Icing:In a small bowl mix the powdered sugar with milk (start with 1 tablespoons, to determine spreading consistancy). Using a mini whisk beat in corn syrup and vanilla. Divide into smaller bowls and add food coloring or leave plain. Decorate cookies and let sit on the racks until frosting hardens. The amount of cookies yielded will vary depending on the size of your cookie cutter. Paw Prints were about 4". Now those are some cute cookies. 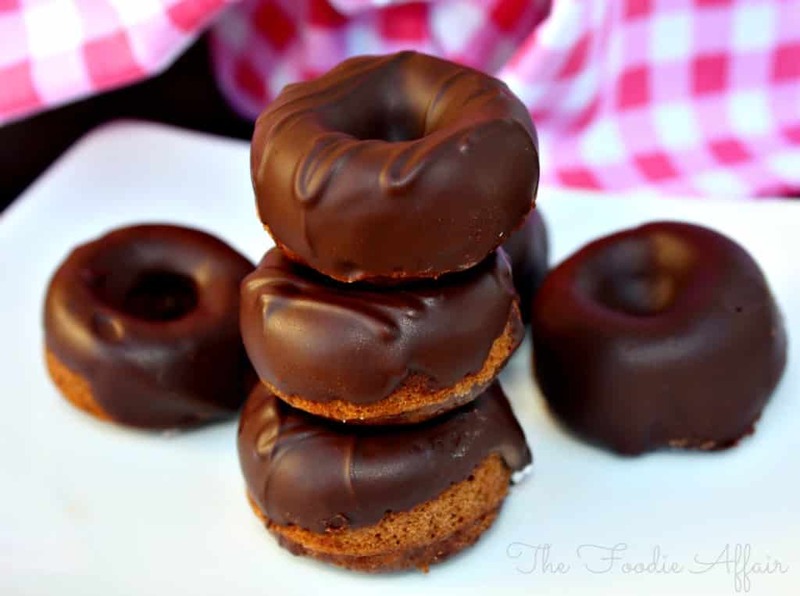 G’day Sandra, How ABSOLUTELY adorable your cookies are today! Hi Joanne! They were sure fun to make! Cheers!! Thank you 🙂 Furry friends tug my heart strings just a bit! I LOVE your paw cookies! 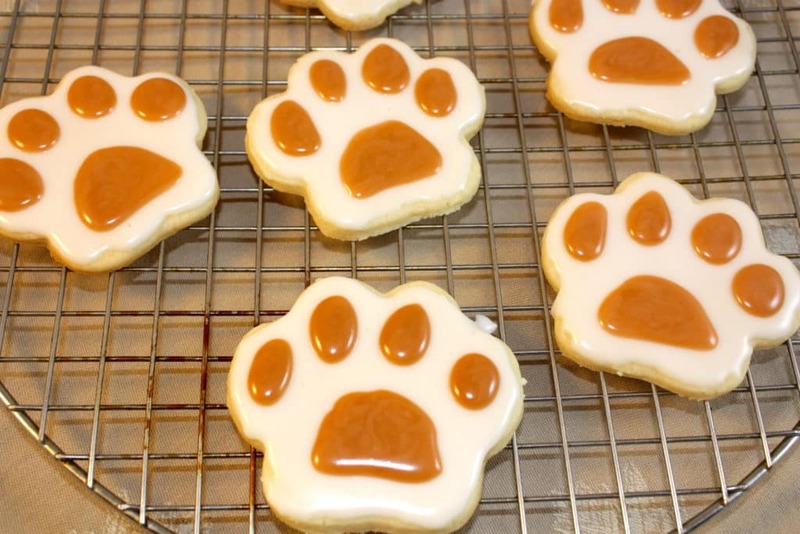 I see the white icing-did you just use food coloring for the paw pads or is that caramel? So THAT’S how you did it! They are SO awesome-I bought the cookie cutter today and can’t wait! You’ve inspired me! how did you get the tan colored frosting so perfectly on the paws? Do you squeeze it on with an icing bag? Yes! Use a piping bag for the outline and then fill it in by spreading the frosting with the tip or a toothpick. Hope that’s helpful!